Ten days after being freed from a line of whelk pots off Blackpool Sands in South Devon the whale returned and was ensnared again. The RNLI Dart inshore lifeboat was already involved in the rescue of a rowing team on the River Dart and was tasked to assist the Salcombe Tamar class all weather lifeboat when the ILB had refuelled and had a crew change. The Salcombe lifeboat located the whale a quarter of a mile offshore opposite Matts Point in Start Bay, slightly west of where she had been trapped previously. The Dart lifeboat put two volunteer crewmen on the Tamar and fetched Ali Jones from the British Divers Marine Life Rescue team to assess the situation. She found that the weight of pots was far greater than on the previous occasion and it was decided to use the winch on the Tamar to lift the buoyed line. Ali was joined by David McDonald from the BDMLR and he and Chris Tracey from the inshore lifeboat crew cut the pots free as they came to the surface including a particularly heavy entangled mesh of the pots. Eventually only a single line ran from around the whale to the seabed and CT was able to cut this and the whale was freed again. 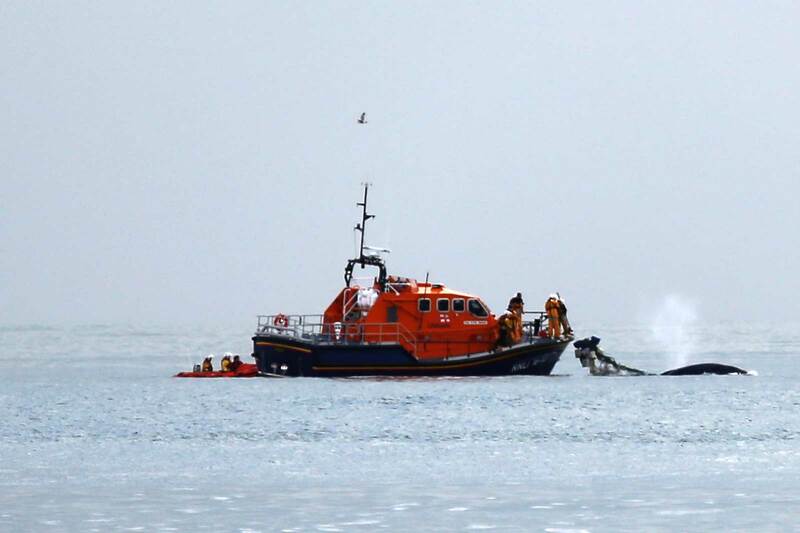 It took two lifeboats with complimentary capabilities to complete this rescue and shows the value of volunteer lifeboat crews training with their flank stations and being willing and able to professionally assist volunteers from other organisations such as those from the BDMLR team.